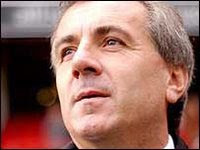 When was the last time football fans sung the name of their chief executive? Just how important Reg was to the club is sadly becoming more obvious by the day. A mediator in the boardroom, a strong negotiator with a brilliant business brain, what will it take to have him back 'at home?' His reasons for leaving are lamentably also becoming clearer too. Sold after Pardew said he wouldn't be, how many times have we heard that? Our most productive, influential and by far and away best player sold to Sunderland on deadline day in "a deal worth up to £4m." We got Lee Cook and Greg Halford in return! For 13 days we were the richest club in the world.... and then we woke up. Credit crunch or some sort of nonsense. These things never happen to us, and we'll probably never know how much further the Zabeel deal rattled the club. Maybe one day in the right circumstances we could all applaud this man being made our manager. As it is, he is kind of last man standing and now he holds the future of our great club in the palm of his hands. The communiqué of Parky's appointment was a joke, and no one's laughing. Good luck Phil. I watched a couple of games last year with my own eyes that probably entered the top 10 of worst ever Charlton performances in my lifetime. Preston in March was bad but Barnsley in November took it to a whole new level. In truth Pardew should have gone that night, allowing the board more time to dilly-dally.